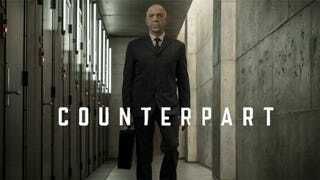 So I don’t know if you all know this or not but there’s a new upcoming Sci-Fi show called Counterpart starring JK Simmons coming out soon on Starz. I bring this up because I’ve heard practically no buzz for it what so ever and that’s unfortunate because having seen the special premiere I can say that I was quite intrigued. And so I’m going to review the special premiere so that you may all also be intrigued. Our plot starts by following one Howard Silk (JK Simmons) a lowly office drone working in Berlin for some unidentified Intelligence agency. Howard’s going nowhere in life as he’s been stuck in the same position for the last 30 years, unable to get promoted. To make matters worse his wife Emily (played by Olivia Williams) has fallen into a coma after a car accident and Howard is being pressured by his in-laws to let be moved back to England. Then things suddenly get crazy as one day at work Howard is taken aside to a dark room where he’s introduced to a hooded man who turns out to him from an alternate universe. It turns out at some point during the Cold War there was an experiment in Berlin that tore open a portal to an alternate universe where things diverged in small but significant ways. For example where Howard in the one universe was a small time nobody his alternate universe counterpart is a ruthless killer and a high ranking intelligence operative. It’s revealed that after the portal was opened both universes have been spying on each other nonstop for the last 30 years and as of recently someone from Ruthless Howard’s has sent an assassin named Baldwin (revealed in the shows Cold Open to be a young woman) to kill a number of people on Sad Howard’s side including Sad Howard’s comatose wife and he’s crossed over to stop it. Ruthless Howard then impersonates Sad Howard with Sad Howard’s help in an attempt to take out Baldwin, which fails after Baldwin notices a detail of the impersonation that Ruthless Howard forgets to cover. The episode ends with a lot of questions as Sad Howard reluctantly decides to help his superiors hunt Baldwin while Ruthless Howard returns home to his universe and meets up with his very much alive version of Emily (He claimed in an earlier conversation that she was dead). All in all I thought that this was a very decent premiere with a strong story going forward. It’s very interesting premise of using alternate universes to tell the story of a Spy Thriller and I look forward to what comes next. I don’t know why this show isn’t getting more buzz but Starz seems to have faith in it as they’ve already ordered a second season. If you’re interested in checking it out for yourself the episode should be on whatever Starz’s app is called and On-Demand. The rest of the season will start airing January 28th at 8 PM EST and I intend to run a thread for it so if you are as intrigued as I am I hope to see you then.